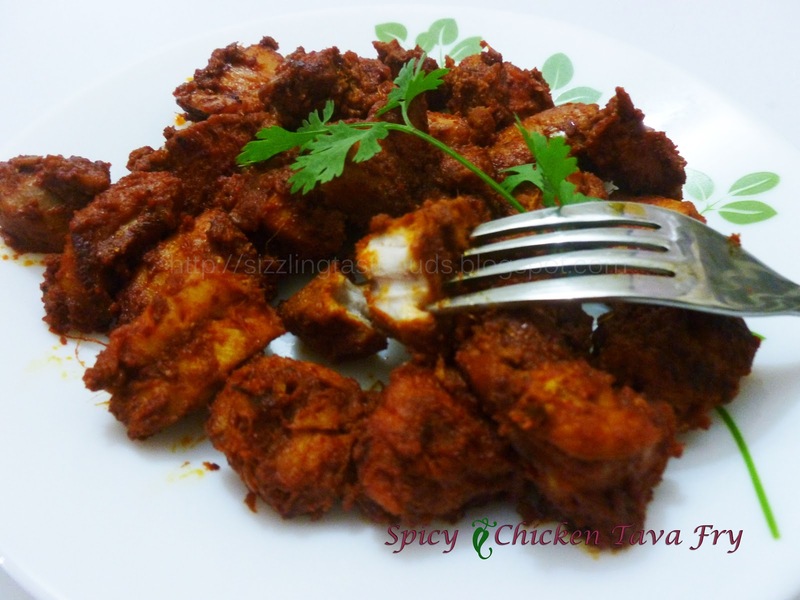 Chicken Tava Fry is one of the easiest and quick Non-veg dish which requires very less ingredients. This dish doesn't include onions and tomatoes too. This tastes best with just simple curd rice or any simple rice dish including rice and rasam/ sambar. 1. Clean the chicken and take it in a mixing bowl. 2. Add in all the ingredients one by one except oil and mix well. You can marinate this but I skipped marination process. 3. Heat 1 tsp oil in a non- stick frying pan. Add the chicken pieces and close the lid. Allow it cook till chicken pieces are almost done.Chicken will leave water and it cooks by itself so don't add any water. 4. Add 2 tsp oil and fry the chicken pieces till you get a nice roasted layer on the pieces. 5. Serve hot with hot steamed rice or even a simple curd rice. Note: I didn't add any food color to this. The color is from the red chilli powder which goes into this dish. Looks so spicy and delicious!! looks so yummy and colorful.first time here. happy to follow you.check my space too.